Ground ice can be defined as ice that occurs within frozen or partly frozen ground, irrespective of the form of occurrence or origin of the ice. Glacier-permafrost interactions are an important influence on ground-ice development because glaciers often supply large amounts of ice and meltwater to subglacial or proglacial permafrost. Nowhere are these interactions more important than in regions where ice sheets advance and retreat across lowlands underlain by thick, frozen sequences of unconsolidated sediments, as recorded in the permafrost of western Arctic Canada and northwest Siberia. Such permafrost contains a complex assemblage of buried ice and intrasedimental ice. Buried glacier ice is of two types: firn-derived glacier ice (firnified glacier ice) and basal glacier ice (basal ice). 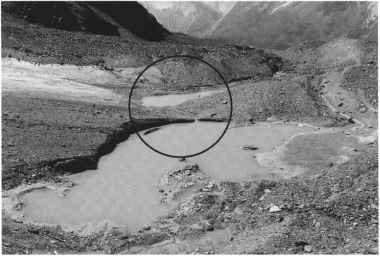 Burial results where (1) sediments are deposited on top of the ice by meltwater, mass movement, lacustrine and aeolian processes (e.g., Moorman & Michel 2000), (2) debris melts out from basal ice, forming an insulating blanket of supraglacial melt-out till or (3) glacial thrusting and shearing emplaces frozen sediment above the ice. If the ice margin lies within the permafrost zone and if the debris cover is thicker than the active layer, the buried ice can be preserved indefinitely in permafrost and becomes part of the permafrost system. In western Arctic Canada, buried ice from the Laurentide Ice Sheet has been preserved for more than 10 ka within large moraine belts, hum-mocky till and glaciofluvial deposits (French & Harry 1990; Sharpe 1992; Dredge et al. 1999; St-Onge & McMartin 1999; Dyke & Savelle 2000; Murton et al. 2005b); in northwestern Siberia buried ice from the Barents-Kara Ice Sheet has been preserved for c. 80-90 ka (Kaplyanskaya & Tarnogradskiy 1986; Astakhov & Isayeva 1988; Svendsen et al. 2004); and in southern Victoria Land, Antarctica, buried ice has been preserved since the Miocene (Marchant et al. 2002). On a smaller scale, buried glacier ice commonly develops in arctic and alpine mountain environments, where supraglacial debris buries the ice-marginal zones of many glaciers (Etzelmiiller & Hagen 2005), some of which develop into debris-covered rock glaciers. If the ice-marginal zone is too warm for permafrost to occur, geothermal and surface heat fluxes are likely to cause gradual decay of the ice core. Such ice-cored moraines are not then part of a permafrost domain (Haeberli 2005). The complex interface between polythermal glaciers and continuous permafrost is explored by Moorman (2005) in the specific context of meltwater flows from the glacier into the proglacial permafrost zone. Intrasedimental ice develops where water freezes or water vapour sublimates within soil, sediment or bedrock. It develops in proglacial permafrost in two situations: (1) where pressurized glacial meltwater freezes onto the base of the permafrost or is injected up into it; or (2) where permafrost re-aggrades through sediments that are subglacially thawed by the insulating effects of a thick body of glacier ice, and then, following glacier retreat, subaerially frozen upon re-exposure to cold winter air temperatures. In both cases, the overall effect of the glacier or ice sheet, except where the ice is predominantly cold-based or where its substrate has a very low permeability, is to predispose the permafrost to becoming ice-rich (i.e., where the ice volume exceeds the pore volume of the ground in an unfrozen state). Besides pore ice (ice cement), the most important types of proglacial intrasedimental ice, in terms of glacier-permafrost interactions, are segregated ice and intrusive ice. These occur as ground-ice bodies that vary from ice lenses and veins of millimetre size or less to tabular bodies of massive ice tens of metres thick and hundreds of metres or more in horizontal extent. An elegant model for the growth of massive intrasedimental ice has been proposed by Mackay (1971, 1989) and Mackay & Dallimore (1992). The model involves the growth of segregated to intrusive ice as permafrost aggrades downwards through ground subject to high pore water pressures. The high pressures arise from (1) pore-water expulsion during freezing of saturated sand, as occurs during growth of hydrostatic pingos (Mackay 1998), but on a larger scale and/or (2) a hydraulic gradient generated, for example, in subglacial meltwater driven towards aggrading permafrost in the proglacial zone of an ice sheet (Rampton 1974), as modelled by Boulton et al (1995) and Boulton & Caban (1995). Mackay suggested that pressurized groundwater nourishes a lens of massive ice growing at or near the contact between silt-clay (frost-susceptible) sediment and underlying sand. The ice type depends on the water pressure: segregated ice forms where the water pressure is sufficient to drive unfrozen water to the freezing front but insufficient to lift the frozen overburden, whereas intrusive ice forms where very high water pressures lift the overburden, as in the case of 'pulsating' pingos, whose ice core rests partly on a lens of highly pressurized water (Mackay 1977). Fluctuating water pressures across the overburden uplift threshold result in interlayering of segregated and intrusive ice. Another important geological consequence of groundwater pressures in excess of lithostatic is the hydraulic fracturing of ice-marginal permafrost and the injection of water that on freezing forms dykes and sills of intrusive ice (Mackay 1989; Mackay & Dallimore 1992). Intrasedimental ice can also form subglacially and contribute to the basal ice layer of glaciers and ice sheets. Pore, segregated and intrusive ice can all freeze onto the bottom of a glacier or ice sheet - regardless of whether the bottom comprises ice or clastic sediment - providing that the freezing front descends beneath the ice body; such ice forms both subglacially and intra-sedimentally, for example within preglacial or glacigenic sediments that become incorporated into a basal ice layer. Rampton & Mackay 1971; Rampton 1974, 1988, 1991; Dallimore & Wolfe 1988; French & Harry 1990; Mackay & Dallimore 1992; Murton et al. 2005b; Murton 2005). The picture that is emerging from this area, especially from cryostratigraphic studies of glacially deformed permafrost, is that much of the ground ice has developed in response to the dynamic interactions between the northwest margin of the Laurentide Ice Sheet and the permafrost beneath and, later, in front of it. During Marine Isotope Stage 2, the margin of the ice sheet advanced across permafrost, causing, in some areas, deformation of massive segregated ice, erosion of preexisting ground ice, burial of basal ice by glacier thrusting, and formation of frozen glacitecto-nites. By analogy with basal ice at the margin of contemporary, sub-polar ice sheets such as that in western Greenland (Knight 1997), the northwest margin of the Laurentide Ice Sheet probably had a thick basal ice layer formed by accretion of both new and existing ice. During deglaciation, pressurized meltwater from the warm-based interior of the ice sheet flowed northwards beneath proglacial permafrost, in places hydraulically fracturing the permafrost and forming dykes and sills of intrusive ice and supplying water to bodies of massive intrasedimental ice. Unlike the older, glacially deformed ground-ice, the ice formed during deglaciation lacks evidence for glacial deformation and it truncates glacitectonic structures. Some postglacial massive intrasedimental ice formed as a result of permafrost aggradation and pore water expulsion from saturated sandy sediments, as modelled by Mackay. Deglaciation was accompanied by significant erosion of Pleistocene sediments by glacial meltwater, and burial of the basal ice continued by a variety of processes, including deposition of aeolian sand and outwash. As the climate continued to warm during the Last Glacial-Interglacial Transition, stagnant masses of the debris-rich basal ice layer were subject to downward melting, burying them beneath supraglacial melt-out till.